All KalaniKats are regularly tested for FIV, FeLv, FIP, intestinal disease, and internal and external parasites. Brutus is a five year old, neutered, brown marble tabby male. He is in excellent health with no known bad habits except he loves to eat! 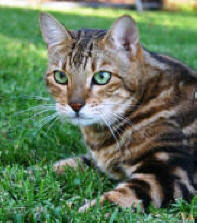 He was bred here at Kalanikats and was returned to us when his owner developed health problems. He is very sweet, purrs non stop and is fearless. He loves to be with people all the time and is very playful. He is a large cat who weighs almost 23 pounds and "wows" everyone who meets him. He is truly an amazing cat and friend. Please click on his picture to see more photos of him. We hope who ever adopts Brutus will consider adopting his life-long friend Shelby as well. See Shelby below. 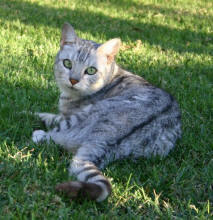 Shelby is an approximately five year old, spayed female and is a silver spotted tabby . She was given to us when her owner developed health problems. She is very sweet but is a "special needs" kitty. She suffers from some kind of spinal cord injury or deformation. She is extremely healthy and has had full testing for disease. She plays and is very loveable. Her mobility is somewhat impaired. She would be an excellent friend for a home bound adult or child. She loves to be around people and loves to be brushed and played with. She requires a low litter box but uses it fine and has no known bad habits. Please click on her picture to see more photos of her. We hope who ever adopts Shelby will consider adopting her life-long friend Brutus as well. See Brutus above. 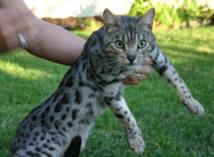 Lambo is a three year old, neutered, silver spotted tabby male. He was raised here at Kalanikats and returned to us when his owner had to move. He is super wild looking, purrs all the time and loves being around people. He also is very playful and entertaining. He is very athletic and loves to jump, really high! He is a lot of fun. He has no known bad habits except he doesn't really like to be held too much. He would much rather play and show you his best high jump! His looks will amaze you! Please click on his picture to see more photos of him. Mattie is a four year old brown spotted tabby male. He will be altered before he goes to his new home. He is truly a legend. 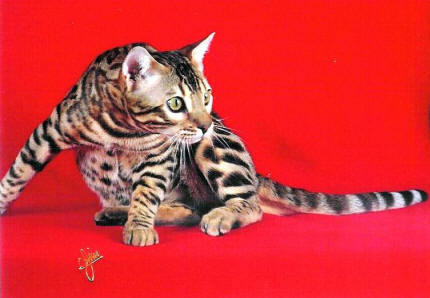 He is an amazing looking cat and a top show cat. He loves to purr and be loved. He does need an experienced cat owner as he can get very excited during play and needs to be reminded of his boundaries. He will also need guidance as he transitions from a whole male to an altered pet, meaning he has sprayed in the past but he will hopefully stop once he is altered. Please click on his picture to see more photos of him. We hope who ever adopts Mattie will consider adopting his friend Shimmer as well. See Shimmer below. Shimmer is a three year old, spayed, silver spotted tabby female. She has an amazing coat that is very glittered and is referred to as a cashmere coat. She is a very quiet cat but loves to play and be petted. She will leave the room if strangers are around but has no bad habits and is very neat and clean. We hope who ever adopts Shimmer will consider adopting her friend Mattie as well. See Mattie above.